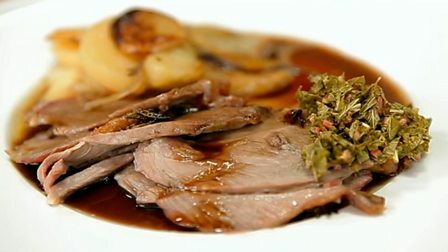 The juices from the slowly roasting leg of lamb drip into potatoes and onions to create a hearty dinner for eight, served with rich red wine gravy and sharp mint sauce. Using a small sharp pointed knife, make a series of small deep slits about 4cm/1½in apart all over the leg of lamb. Into each cut insert a sliver of garlic and a small sprig of rosemary, pressing them right down inside. Drizzle with the olive oil and a good sprinkling of salt, then set aside while you build the potato dish. Layer the potatoes and onions in a large ovenproof tray, seasoning each layer with salt and black pepper, and finishing with a layer of potatoes. Dot with butter, then pour over the stock and press down lightly. Put the roasting dish into the bottom of the oven, and place the lamb on a small wire rack on the oven rack directly above the potatoes (so that any juices from the lamb will ‘weep’ onto the potatoes below). Leave to roast for 1½ hours, or until the potatoes are cooked through, pressing the potatoes down into the cooking liquid every 30 minutes as it cooks. Pour the red wine and beef stock into a sauté pan or large frying pan and set over a medium heat, bring to the boil and cook for 30-45 minutes, or until reduced to a quarter of the original volume and is thickened to make a glossy gravy. Add a little knob of butter and check the seasoning. Remove the lamb from the oven when cooked to your liking and let it rest for 15 minutes before carving. Meanwhile heat the malt vinegar, sugar and a pinch of salt in a clean pan until just simmering, then add the mint and stir until wilted. To serve, carve the lamb and serve with the potatoes, gravy and mint sauce.